The end of the 18th century was a turning point for the Gaspe Coast. From 17778, soon after the American Declaration of Independence, a great number of Loyalists (Americans who wished to remain loyal to the British crown), left their country to settle in Canada and in the Maritime colonies. Unaware, of course, of their later influence on the history of New Carlisle, many of them arrived in the Baie des Chaleurs on June 29, 1784. They had come from Maniche, a refugee camp that had been set up for them near Trois Rivières. After landing in Paspebiac, some decided to settle there, but 22 families went on a few miles west to somewhat higher ground and named the place Little Paspebiac, until a Dutchman named William Vondelvenden gave the new settlement the name of New Carlisle. 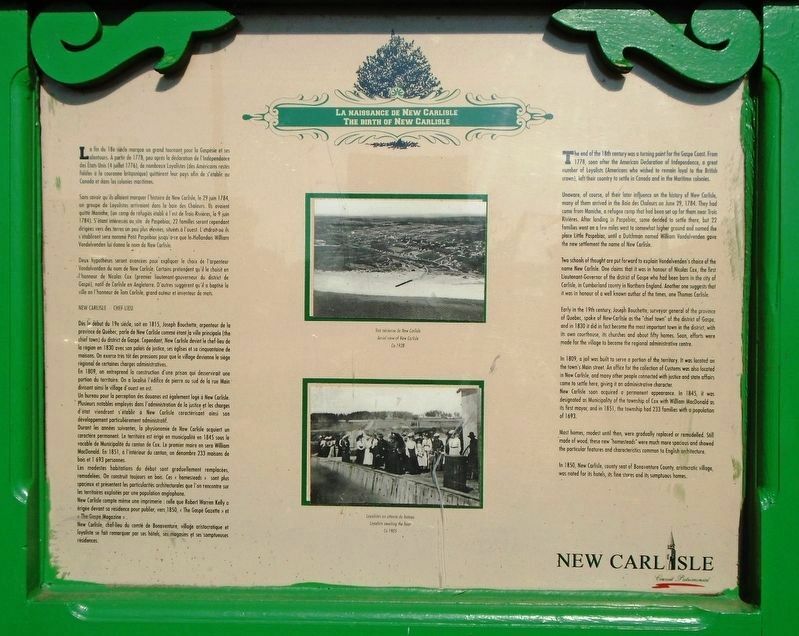 Two schools of thought are put forward to explain Vondelvenden's choice of the name New Carlisle. One claims that it was in honour of Nicolas Cox, the first Lieutenant-Governor of the district of Gaspe who had been born in the city of Carlisle, in Cumberland county in Northern England. Another one suggests that it was in honour of a well known author of the times, one Thomas Carlisle. Early in the 19th century, Joseph Bouchette, surveyor general of the province of Quebec, spoke of New Carlisle as the "chief town" of the district of Gaspe, and in 1830 it did in fact become the most important town in the district, with its own courthouse, its churches and about fifty homes. Soon, efforts were made for the village to become the regional administrative centre. In 1809, a jail was built to serve a portion of the territory. It was located on the town's Main street. An office for the collection of Customs was also located in New Carlisle, and many other people connected with justice and state affairs came to settle here, giving it an administrative character. New Carlisle soon acquired a permanent appearance. 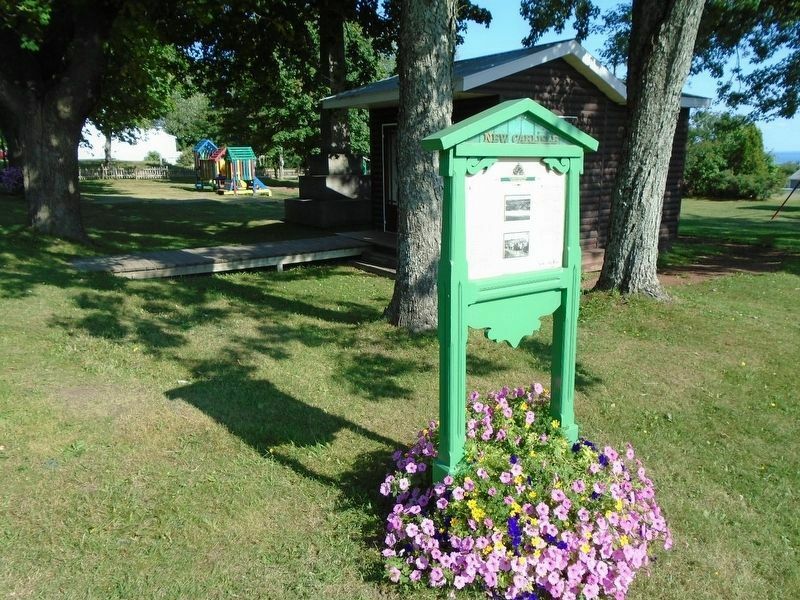 In 1845, it was designated as Municipality of the township of Cox with William MacDonald as its first mayor, and in 1851, the township had 233 families with a population of 1693. Most homes, modest until then, were gradually replaced or remodelled. Still made of wood, these new "homesteads" were much more spacious and showed the particular features and characteristics common to English architecture. In 1850, New Carlisle, county seat of Bonaventure County, aristocratic village, was noted for its hotels, its fine stores and its sumptuous homes. Within the park boundaries there are two monuments. 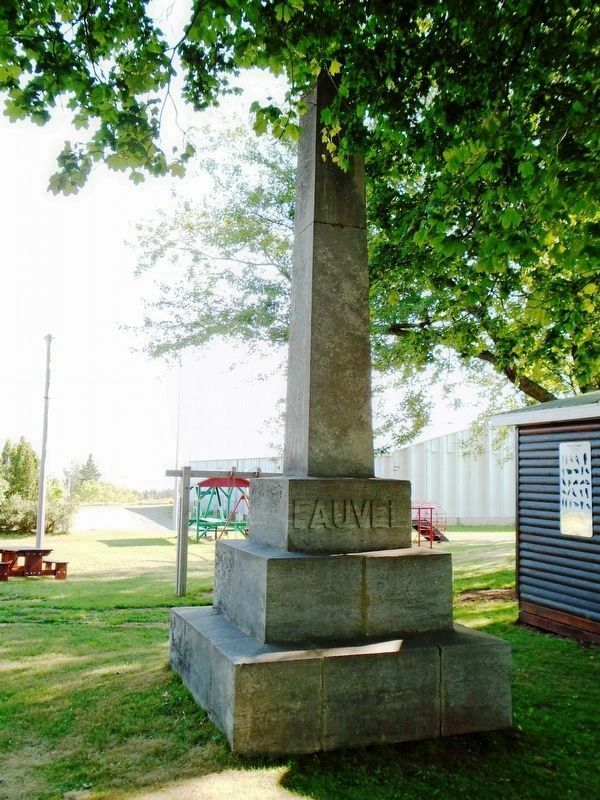 One of them, the Fauvel monument, was erected in honour of William LeBoutillier Fauvel (1850-1897), on the day of his burial, 1897. Originally from Jersey island, William Fauvel was without a doubt, one of New Carlisle's most illustrious citizens ever. Son of John Fauvel, he managed one of the town's long disappeared land marks, LeBoutillier' Brothers Store. He was mayor of New Carlisle from 1889 until 1897. He was elected as the county's first federal deputy in 1891, and reelected in 1896. William LeBoutillier Fauvel left an undeniable mark on the early history of New Carlisle and the historical monument bearing his name will help preserve that memory. Just to the west of the Fauvel monument, there is a cenotaph. 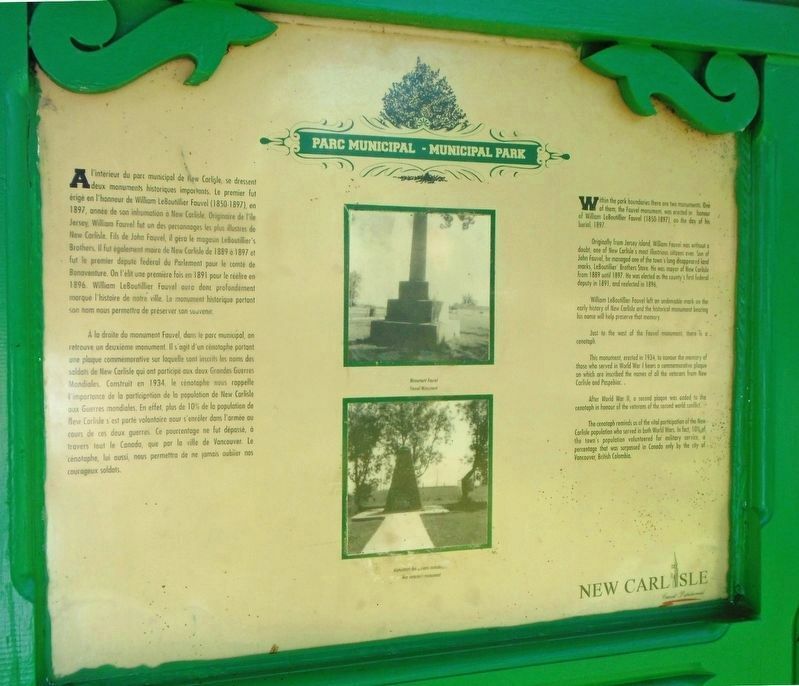 This monument, erected in 1934, to honour the memory of those who served in World War I bears a commemorative plaque on which are inscribed the names of all the veterans from New Carlisle and Paspebiac. After World War II, a second plaque was added to the cenotaph in honour of the veterans of the second world conflict [and Korea]. The cenotaph reminds us of the vital participation of the New Carlisle population who served in both World Wars. In fact, 10% of the town's population volunteered for military service, a percentage that was surpassed in Canada only by the city of Vancouver, British Columbia. La fin du 18e siècle marqua un grand tournant pour la Gaspésie et ses alentours. À partir de 1778, peu après la déclaration de l'Indépendance des États-Unis (4 juillet 1776), de nombreux Loyalistes (des Américains restés fidèles à la couronne brittanique) quittèrent leur pays afin de s'établir au Canada et dans les colonies maritimes. Sans savoir qu'ils allaient marquer l'histoire de New Carlisle, le 29 juin 1784, un groupe de Loyalistes arrivaient dans la baie des Chaleurs. Ils avaient quitté Maniche, (un camp de réfugiés établi à l'est de Trois-Rivières, le 9 juin 1784). S'étant intéressés au site de Paspébiac, 22 familles seront cependant dirigées vers des terres un peu plus élevées, situées à l'ouest. L'endroit où ils s'établiront sera nommé Petit Paspébiac jusqu'à ce que le Hollandais William Vondelvenden lui donne le nom de New Carlisle. Angleterre. D'autres suggèrent qu'il a baptisé la ville en l'honneur de Tom Carlisle, grand auteur et inventeur de mots. Dès le début du 19e siècle, soit en 1815, Joseph Bouchette, arpenteur de la province de Québec, parle de New Carlisle comme étant la ville principale (the chief town) du district de Gaspé. Cependant, New Carlisle devint le chef-lieu de la région en 1830 avec son palais de justice, ses églises et sa cinquantaine de maisons. On exerce très tôt des pressions pour que le village devienne le siège régional de certaines charges administratives. En 1809, on entreprend la construction d'une prison qui desservirait une portion du territoire. On a localisé l'édifice de pierre au sud de la rue Main divisant ainsi le village d'ouest en est. Un bureau pour la perception des douanes est également logé à New Carlisle. Plusieurs notables employés dans l'administration de la justice et les charges d'état viendront s'établir à New Carlisle caractérisant ainsi son développement particulièrement administratif. Durant les années suivantes, la physionomie de New Carlisle acquiert un caractère permanent. Le territoire est érigé en municipalité en 1845 sous le vocable de Municipalité du canton de Cox. Le premier maire en sera William MacDonald. En 1851, à l'intérieur du canton, on dénombre 233 maisons de bois et 1 693 personnes. habitations du début sont graduellement remplacées, remodelées. On construit toujours en bois. Ces « homesteads » sont plus spacieux et présentent les particularités architecturales que l'on rencontre sur les territoires exploités par une population anglophone. New Carlisle compte même une imprimerie : celle que Robert Warren Kelly a érigée devant sa résidence pour publier, vers 1850, « The Gaspé Gazette » et « The Gaspé Magazine ». New Carlisle, chef-lieu du comté de Bonaventure, village aristocratique et loyaliste se fait remarquer par ses hôtels, ses magasins et ses somptueuses résidences. marqué l'histoire de notre ville. Le monument historique portant son nom nous permettra de préserver son souvenir. À la droite du monument Fauvel, dans le parc municipal, on retrouve un deuxième monument. Il s'agit d'un cénotaphe portant une plaque commémorative sur laquelle sont inscrits les noms des soldats de New Carlisle qui ont participé aux deux Grandes Guerres Mondiales. Construit en 1934, le cénotaphe nous rappelle l'importance de la participation de la population de New Carlisle aux Guerres mondiales. En effet, plus de 10% de la population de New Carlisle s'est porté volontaire pour s'enrôler dans l'armée au cours de ces deux guerres. Ce pourcentage ne fut dépassé, à travers tout le Canada, que par la ville de Vancouver. Le cénotaphe, lui aussi, nous permettra de ne jamais oublier nos courageux soldats. des Chaleurs on June 29, 1784. They had come from Maniche, a refugee camp that had been set up for them near Trois Rivières. After landing in Paspebiac, some decided to settle there, but 22 families went on a few miles west to somewhat higher ground and named the place Little Paspebiac, until a Dutchman named William Vondelvenden gave the new settlement the name of New Carlisle. Location. 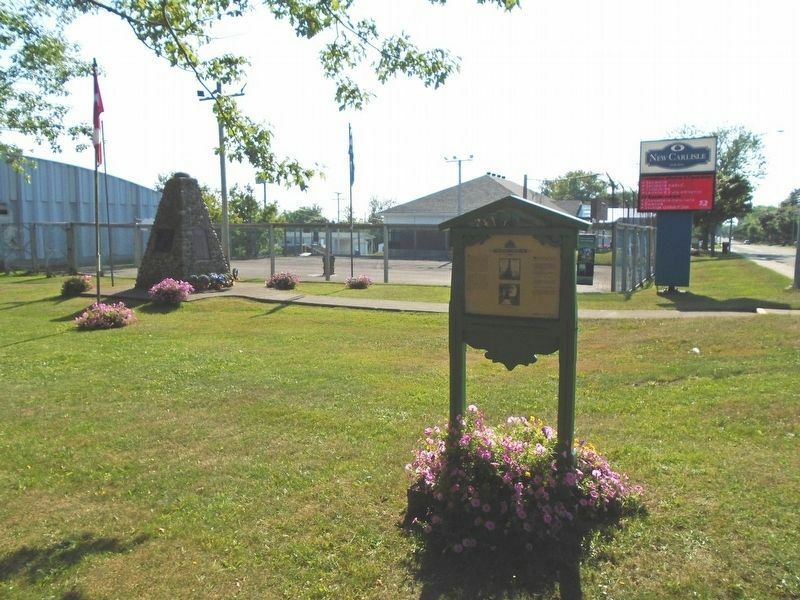 48° 0.571′ N, 65° 19.633′ W. Marker is in New Carlisle, Quebec, in Bonaventure MRC. Marker is at the intersection of boulevard Gérard-D.-Levesque (Quebec Route 132) and rue de l'Oriental, on the right when traveling east on boulevard Gérard-D.-Levesque. Touch for map. Monument is in the municipal park, just east of the Town Hall. Marker is at or near this postal address: 138 boulevard Gérard-D.-Levesque, New Carlisle, Quebec G0C 1Z0, Canada. Touch for directions. Other nearby markers. At least 7 other markers are within walking distance of this marker. Légion Royale Canadienne / Palais de Justice (a few steps from this marker); War Memorial (within shouting distance of this marker); The Loyalist / Les Loyalistes (about 90 meters away, measured in a direct line); L'eglise presbyterienne - Knox Presbyterian Church (about 90 meters away); Maison Tremblay House / L'eglise Unie Zion United Church (about 150 meters away); L'Eglise anglicane Saint Andrew's Anglican Church (approx. 0.7 kilometers away); L'education - New Carlisle High School (approx. 0.8 kilometers away). More. Search the internet for La naissance de New Carlisle / Parc municipal. Credits. This page was last revised on February 26, 2019. This page originally submitted on February 26, 2019, by William Fischer, Jr. of Scranton, Pennsylvania. This page has been viewed 38 times since then. Photos: 1, 2, 3, 4, 5. submitted on February 26, 2019, by William Fischer, Jr. of Scranton, Pennsylvania.